Patagonia is a nature lover’s paradise. Scattered among the six provinces are numerous tiny towns and well kept secrets of the land, but we are primarily going to address a few of the most common, must see stops along the way. Tierra del Fuego literally means The Land of Fire and it encompasses a small group of islands in the far south of the Americas. Tourists from far and wide set their sites on this archipelago to experience The End of the World and to discover the secrets of this remote destination. It is surrounded on three sides by ocean, both the Atlantic and the Pacific, it encompasses two countries, both Argentina and Chile, and it contains the southern most city in the world, Ushuaia, which is a hub for Antarctic touring and navigating the Strait of Magellan. The Rio Grande marks the northern border of this land of daydreams and mystery where you can experience the longest nights in winter and the longest sunlit days in the summer. This land of extremes deserves recognition for many reasons other than its location. Ushuaia lies on the main island of Tierra del Fuego. It is cradled between the end of the Andes Mountain chain to the north, and the cold glacial waters to the south. It is a cozy little town, surrounded with beauty and wildlife. Right on the other side of the Beagle Channel is the Chilean side of Tierra del Fuego that is made up of smaller islands that are equally as fascinating. Tierra del Fuego is not an easy place to get to, so when you finally do, you want to make sure you do plenty of exploring both on land and sea. Adventure tours are available year round for mountain biking, horse back riding, kayaking, scuba diving, overlanding, trekking, and navigational trips to help you do so. Ships disembark from the Ushuaia port on a regular basis that provide opportunities to see the whole area. You can cruise through the Beagle Channel; and if you are really feeling adventurous, you can continue beyond – through the Drake Passage, amidst the glowing blue glaciers, and into Antarctica for a once in a lifetime experience. The natural habitat includes various marine animals and scenery that awaken emotions and demonstrate exactly why a visit to Tierra del Fuego is equally as extreme, mysterious, and attractive as the mere idea of going to the End of the World. 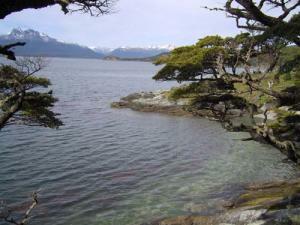 For more detailed information on Tierra del Fuego, please see our Tierra del Fuego page on Argentina’s Travel Guide. Perito Moreno is one of the world’s largest glaciers that hosts travelers from far and wide. It sits within the Santa Cruz province which is known for its immense qualities and surroundings. This area of the country is characterized by infinite skies, an extensive marine coast, rocky spires tucked within the Andes, some of Argentina’s largest ranches, green valleys, petrified forests, and so much more. El Calafate is the town where most make their overnight reservations and head out on a tour of the glacier from there. The town itself has a mere population of about 8,000 people and can be thoroughly seen in a day. The main road in town is lined with tour guide companies, art shops, and outdoor adventure stores. All of which will give you an insight into the beautiful surroundings of the area that will be seen in your trip out to Perito Moreno. It’s not only the sights of the glacier that wow the crowds of Perito Moreno, but also the sounds. The magnificent glacier produces crowd stopping roars that interrupt the infamous Patagonia silence. Never again will you see so many crowds observing a piece of Mother Nature with such respect and admiration. All eyes are glued on the glacier as everyone anxiously awaits the rupture of the one of the big pieces of ice. Occasionally a corner of Perito Moreno, or possibly even a whole face of ice will break off and come crashing down into the waters below. The layered balconies that look out over the glacier, as well as all decks of the regularly scheduled boat tours are full of people and cameras that are waiting to experience this once in a lifetime show. For more detailed information on Perito Moreno, please see our Perito Moreno page on Argentina’s Travel Guide. Peninsula Valdes is most commonly recognized for its whale-watching opportunities and its up-close-and-personal experiences with nature. The Peninsula provides a peaceful refuge for the Southern Right Whales as well as many other fascinating marine animals; and there is nothing quite as astounding as being able to experience a day in the life of these fantastic creatures and their beautiful surroundings. Various forms of marine wildlife call Peninsula Valdes their home, their sanctuary. But they are not the only ones who have recognized the wonders of this natural reserve. In 1999 UNESCO officially declared Peninsula Valdes a world heritage site and therefore a V.I.L. – Very Important Location. While the animal watching is impressively entertaining , it is important to note that along with the sea not only come many sea creatures, but also many sea sports. An endless number of activities are available for those looking for an upbeat adventure. In the area you can learn how to windsurf, go scuba diving, try your luck at deep sea fishing, go on a boat cruise, rent a kayak, and much more. And those travelers looking for a more relaxing adventure, can always retreat to the sun-soaked beach for some well deserved R & R. When you finally take off your shoes and let your feet sink into the warm sand you will be glad you made the trip. Peninsula Valdes, on land and in the sea, provides wildlife at its best and an opportunity to enjoy this beautiful area and the small town Patagonian spirit. For more detailed information on Peninsula Valdes, please see our Peninsula Valdes page on Argentina’s Travel Guide. The Lake District is arguably one of the most beautiful parts of Argentina. Outdoor enthusiasts from around the world retreat to this destination in search of extreme outdoor adventures and peaceful escapes into Mother Nature’s incredible creations. Along with its jaw dropping aesthetic appeal, the diverse quantity of natural attractions and activities within these vast austral lands make it a highly demanded site. The Lake District not only includes Argentina, but also occupies part of the southern territories of Chile. With the vast quantities of water, an incredible way to journey across the border is by embarking on a cruise ship that weaves its way through the famous Andes Mountains that mark the border between the two countries. The Andes form the longest mountains range in South America and are the highest mountains outside of Asia. They provide unmatched scenery throughout the whole area. Various national parks have been developed due to the incredible combination of the mountains, lakes, volcanoes, pure state of the surroundings, and sheer beauty. As you can imagine, the Lake District, is made up of enormous quantities of fresh water. There are 20 great lakes included in the region, the largest on the Argentina side being Nahuel Huapi which sits right off the shores of Bariloche. These wild waters provide many sporting activities, chief among which are fishing. The ultimate fishing tales are made in this area and have given Patagonia fishing a world wide presence. Trekking, skiing, rafting, kayaking, rock climbing, fishing, and every other outdoor activity imaginable is offered in the Lake District and will allow you to enjoy the experience to the max with the extreme scenery and the wild state of the land and nature. For more detailed information on the Lake District, please see our Lake District page on Argentina’s Travel Guide.